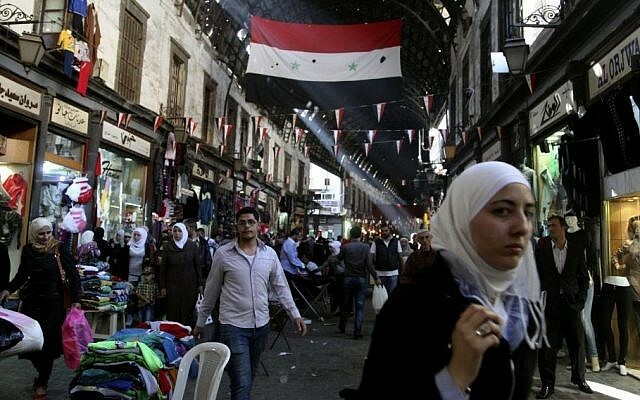 DAMASCUS, Syria (AP) — The middle-aged salesman sat glumly among an array of shorts, khaki leisure suits bedecked with gold belts and dresses with plunging necklines in the ancient Damascus bazaar — luxuries few can afford in today’s Syria. He, like many traders, lost most of his customers when Syria’s uprising erupted in 2011 against the rule of President Bashar Assad, and his new clientele is far poorer: Syrians fleeing the fighting with barely any possessions. Now, he fears there’s even worse to come, as the US-led bombings of the Islamic State group target the country’s modest oil reserves under the militants’ control, sending oil and diesel prices soaring. 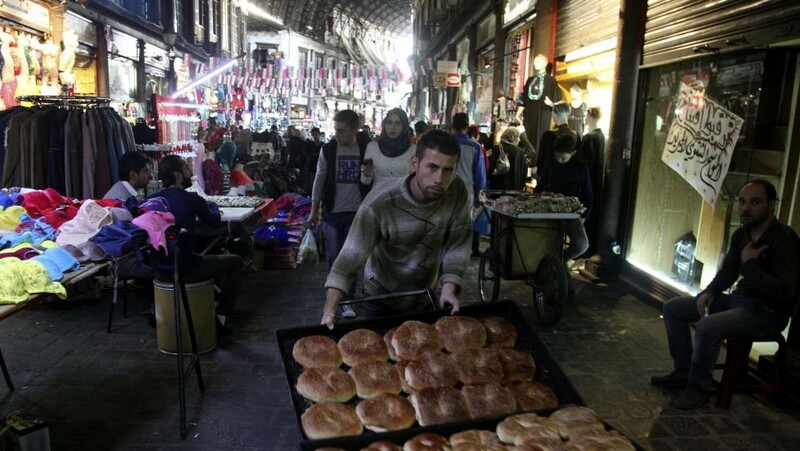 The effect is rippling through the economy, and traders fear they won’t be able to absorb the increased costs, pushing them out of business and unraveling yet another key sector of Syrian society, already badly frayed by conflict. 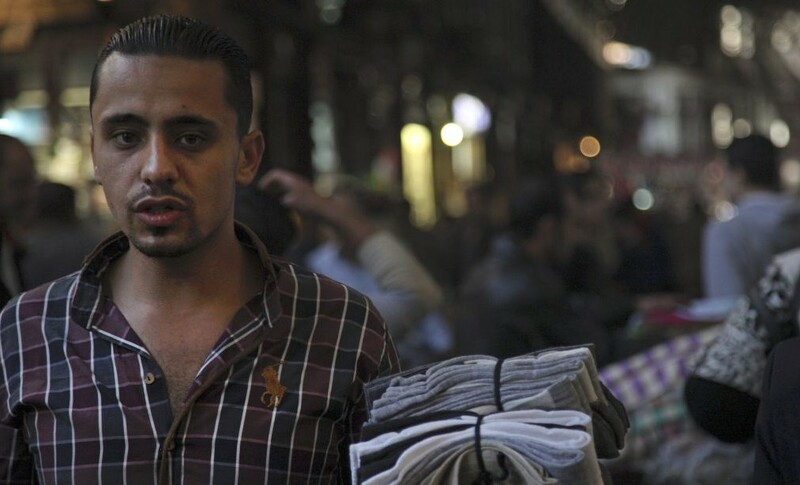 Like all traders who spoke to The Associated Press, he declined to provide his last name, for fear of being identified as criticizing the Syrian government. Earlier this month, the government raised the subsidized price of diesel from 36 cents to 48 cents a liter just before a major Islamic holiday. The price of heating oil went from 73 cents a liter to 85 cents. The increased prices were tied to the US bombing of small oil wells, tankers and pumping stations under the control of the Islamic State group in the eastern Syrian provinces of Deir al-Zour and Hassakeh, which began in late September. The militants had been selling the fuel at a cut-rate price — including some $1 billion to the Syrian government — and the proceeds amounted to one of the group’s main sources of income, according to a Mideast-based Western diplomat who spoke on condition of anonymity because he was not authorized to speak to the media. Syria has modest oil reserves. Before the conflict it was pumping 360,000 barrels a day; since the fighting it has only managed 16,000 barrels, said Syria economy expert Abdul-Qader Azouz. That has made it reliant on exports, and militants selling back the country’s resources. The knock-on effects of the latest fuel price hike and continued bombings have already impacted the price of bread, yogurt and milk. The price of a loaf of unsubsidized bread rose to 97 cents from 85 cents — more than four times the 21-cent price tag before the crisis. Milk rose to $1.13 from $1. Before the crisis it was 30 cents. 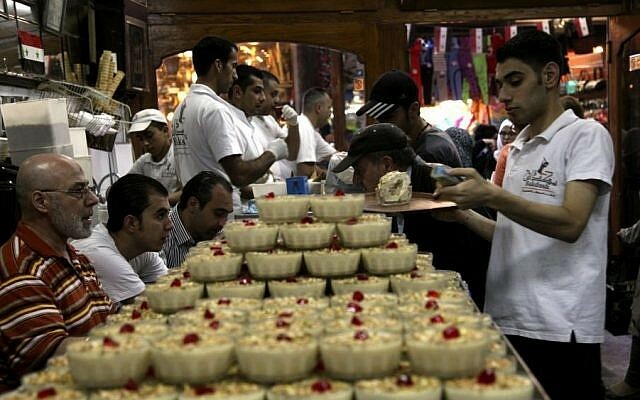 The prices of other goods are likely to rise in the next few weeks, said traders at the Damascus bazaar, known as the Hamidiyeh Souk, who are an important measure of the economy’s pulse. 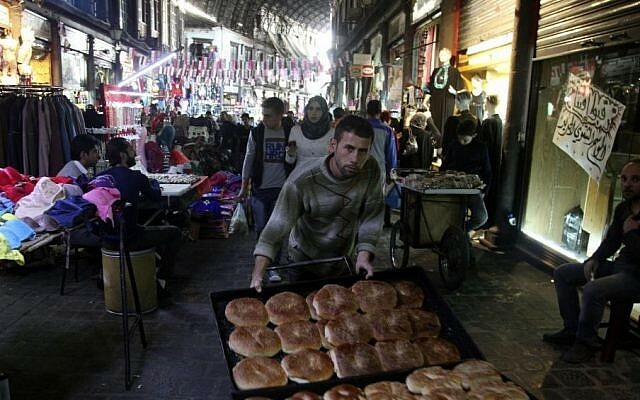 One of Syria’s chief markets, it was once packed with tourists and visitors from around the country who shopped in its cavernous maze of arched alleyways and ancient Roman columns, snapping up everything from antiques to wispy lingerie and sweets — a rumble of chaotic crowds and pigeons flying overhead. Even amid the conflict, it’s still an important shopping spot for the country’s working classes. Prices have already quadrupled over the past four years for most products in the market. The printed leisure suit in Amin’s stall cost $6 pre-war; now it’s $21. While that appears cheap by Western standards, salaries are low in Syria: Most civil servants and soldiers are paid around $100 a month. The price tag for a bottle of perfume at another stall was $4.30. Pre-conflict it was $1.50. “And at the lower price, we were making a better profit on it,” because of the increased cost of raw materials, said trader Hussam. As he spoke, a Syrian government plane flew overhead, followed by the thud of a bomb dropping. Nobody flinched. On a recent day, the busiest place was Bekdash, a century-old ice cream shop considered to make the finest gelato in Syria. But even here, the shop was only half full after prices quadrupled from 30 cents a cup to $1.20. Azouz, the Syrian economy expert, said the government was trying to stave off more losses by appealing to Russia for fuel supplies and wheat. It was also asking Iran for guarantor credit lines of $3 billion for oil products and another $1 billion for other expenses, he said. Azouz said resources were being diverted to ensure “the steadfastness” of the Syrian army — meaning soldiers had first access to fuel and food — and to cover payments for the families of soldiers killed in the fighting. The Syrian government has come under fire from its own loyalists for the staggering number of soldiers killed during the conflict, now in its fourth year. 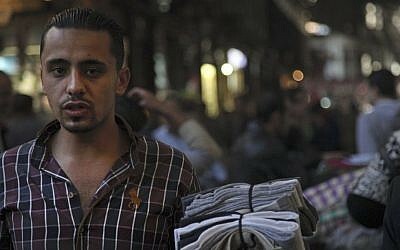 The central bank has also intervened to ensure the Syrian pound doesn’t collapse, a policy Azouz said would continue. Most of Syria’s impoverished have already hit rock bottom. One 20-year-old vendor, Mohammed, who works selling vegetables to try to cover his family’s $90 monthly rent, said his family was relying on food aid donated by the social ministry. “It’s beans, sugar and oil,” he said. “We are as you see us,” he added, pointing to his shabby pants and jacket. Another woman, who said her family was living off her son’s salary as a soldier and her husband’s pension, said they hadn’t bought diesel to heat their home in two years because it had become too expensive. 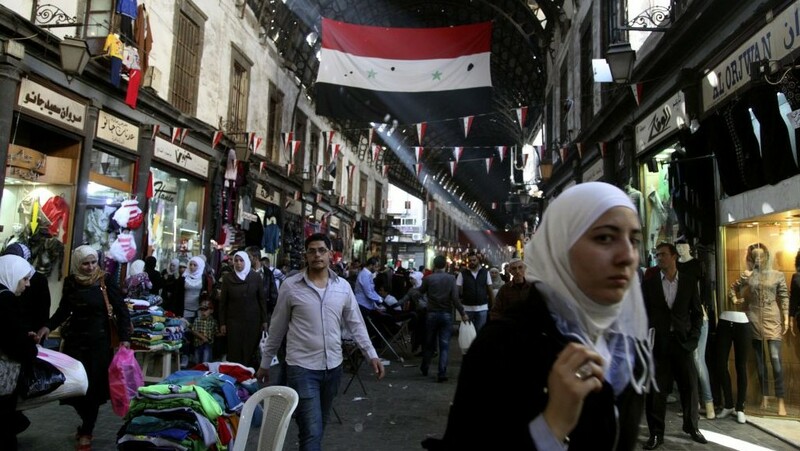 It wasn’t immediately clear how many Syrian businesses have shut down during the conflict. Some have moved to neighboring Lebanon and Jordan, while others have closed because they were in active battle zones, or because they were bombed into rubble. But even here, in the relatively safe Hamidiyeh area, about a quarter of the shops were closed. A handbag trader said he wasn’t sure how much longer he could hold on if prices rose again, badly cutting into profits when sales were already so bad. 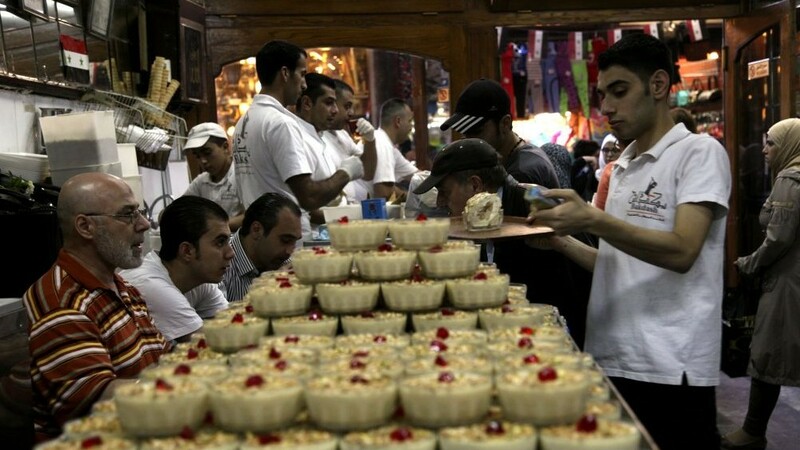 “The first year, the second year, those who had good work before the crisis and whose situation was middle class or better — they had a bit of money,” said Firas. But now, traders were running out of cash to cover their continuous loses. “The trader who could hold on for two or three years — I don’t think he can survive for five years,” he said.